Let me ask you this, was there any fallout from this story as far as impact on advertising revenue? If so, was it worth it? I’m not sure what that story accomplished? There was definitely fallout. Concord Group, which owns the Nationals, among many other restaurants and pubs, pulled all of their advertising after being with us for almost the entirety of the paper’s existence. Was it worth it? Depends, I suppose. I certainly think that a story about bouncers at a popular inner-city bar allegedly beating someone near death is a worthwhile story. In terms of what it accomplished, unfortunately very little in terms of concrete changes or actions, but one hopes that people are more aware of some of the dangers that could potentially exist with staff that might be overaggressive. At the very least we gave voice to someone that didn’t have one. I think it was worth it, but I know there are others that disagree. Being one of the folks that replied to the bitter-sounding tweet from FFWD… You’re right, I missed the point… Not because I didn’t know about the trademark, but because I don’t feel there is a fair comparison between the two publications. I picked up a copy of Branded once, and yes, I noticed the bias right away. It’s not journalism, that’s for sure… but it does provide a purpose. 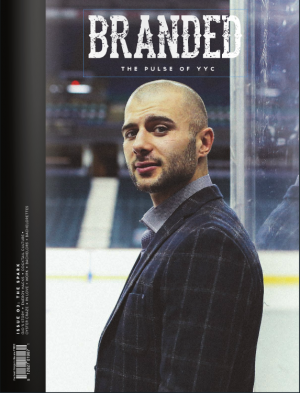 There are lots of people in Calgary that will pick up a brainless info-tainment magazine because it’s glossy and expensive-looking and strokable to the touch. This kind of casual reading is designed to bolster the reader’s ego, not their intellect. For this reason, I feel that the comparison of FFWD to Branded is one of apples and oranges. The only reason people are having this discussion is because the folks at Branded are trying to ride on the coattails of a publication that doesn’t even serve their target readership… and it blew up in their face. Not because they had malicious intent, but because they are still learning that their expensive-looking Brand is really quite disposable, and it will be years before they have earned the fierce loyalty and quality writers that FFWD did. As this public outcry on Twitter has demonstrated, there are plenty of people that respect the hard work and dedication that FFWD was faithfully delivering every week… but this city is also filled with snobbish BMW-driving mofos that will never care about Calgary the way FFWD did. These people need stuff to read and throw away too. Thank you for that crap, Elaine. AND in other news.. It looks like the neocolonial, neo-conservative, white-privileged, heteronormative, paradigm of capitalism, meritocracy, and “don’t rock the boat” is expanding it’s hold on on the minds of Canadians through yet another biased garbage-publication. Back to you Reh. Honestly FFWD had a good run, but you guys didn’t play to your strengths. I understand wanting to take a journalistic stand, but your organization would have been well suited to promotion instead of actively biting the hands that fed you. I agree with the “neo-conservative” above you, this kind of outburst just reeks of sour grapes. Settle down hipsters. Fast Forward is closed. The business model failed. There’s no point crying about it. Had they capitalized on their strengths (reader polls, events, etc.) rather than coming up with articles that pissed off advertisers and most people didn’t read, they’d probably still be in business. I’m disappointed that Fast Forward closed and I’m looking for a new paper to pick up. Clearly there’s a void in the marketplace and other magazines, newspapers & websites are going to capitalize on it. They’d be stupid not to mention Fast Forward as they stake a claim for new readers. Trying to stay relevant by calling other publications copy cats is pretty pathetic, especially when the business model didn’t work. Nobody is copying Fast Forward, unless they’re going for the same fate. Nailed it. Shameless promotion and boosterism. One need only look at some of the people and businesses covered in the mag and their relationships with mag staff. James Boettcher and his business interests, for example, are in every issue and he is heavily connected to the mag founder. Can Calgary really expect a fair and open process? The association with FFWD would be offensive if not comical. Branded is disgusting mag/rag read by disgusting people. Branded is #3 in the troubling boosterism category. THEOGM (#2) and that idiot Calgaryism (#1).